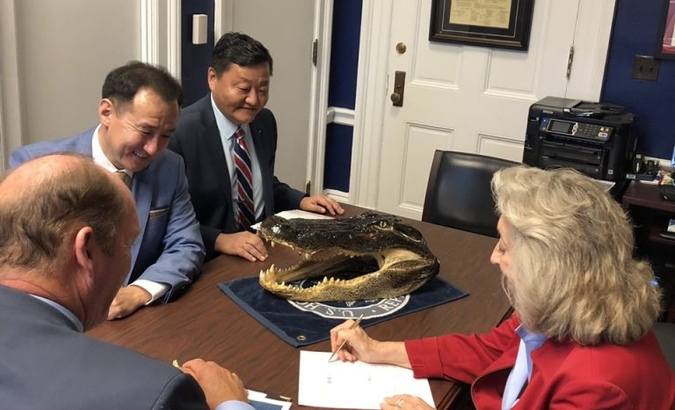 AKIPRESS.COM - Mongolian Minister of Foreign Affairs Damdin Tsogtbaatar met with Co-Chair of US Congressional Mongolia Caucus Dina Titus and Ted Yoho on the sidelines of the First Ministerial Meeting on Religious Freedom held on July 25-26 in Washington, Montsame reported. The parties highlighted that Mongolia is a country that consistently backs democracy and is an important partner of USA. They briefed about their plan to submit a draft law on ‘Mongolia Third Neighbor Trade Act’ to the Congress in the near future which is about exporting Mongolian textile products to American market tariff free. Minister Tsogtbaatar expressed his gratitude and said he is confident that the draft law which is a joint effort of the two parties of the Congress will give big stimulus to develop Mongolia-USA trade and economic ties as well as to increase jobs, supporting Mongolia’s economic development. President of Mongolia Kh.Battulga had put a propasal to President of the United States Donald Trump on exporting Mongolian textile goods tax-free to the US and the draft law is the first step to the realization of the initiation.